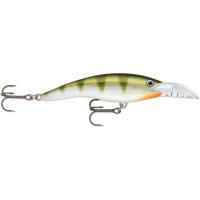 Rapala Scatter Rap Tail Dancers feature a scatter lip design and a tapered tail. These two features combine wide swinging tail action with erratic lip movement, making this lure irresistible to any game fish. The Scatter rap line creates the skittish actions of a real fleeing bait fish. These floating lures are made from balsa and have evasive sweeping action perfect for casting or trolling.